Get the most out of your solar energy system. Keep it clean. GoClean! You have invested a lot of money to get your solar energy system, and now you want it to work as efficiently as possible so that you can get the expected savings and the highest return. Hence it is important that your solar panels can capture as much of the sun’s energy as possible. 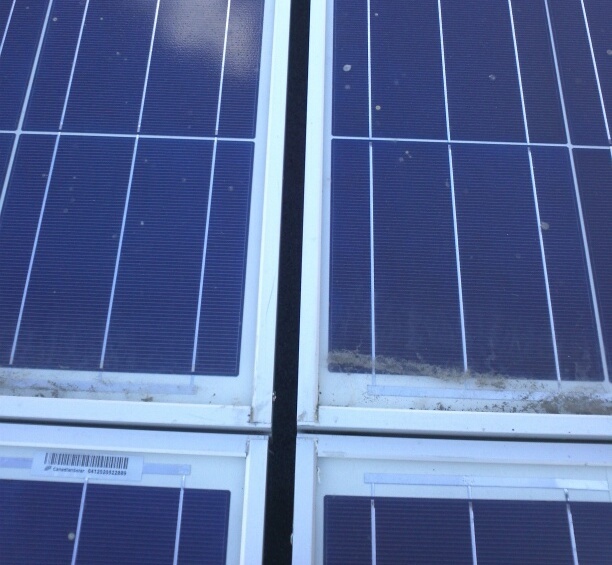 But exposure to the environment causes soiling due to dust, smog particle and pollen depositions on the solar panels (see image below), which degrades the efficiency and energy production of the system often by 15% or more. Infrequent rain precipitation, particularly during the high-production summer months, intensifies and prolongs this undesirable condition. Regular cleaning of the solar panels is therefore very important to ensure that the system performs at the desired capacity and provides the expected savings. A recent analysis of the performance of solar panels at four different sites showed efficiency increases between 9 and 26 percent after cleaning. The right column in the table below shows how much money would be lost due to a reduction of system performance if the panels were not cleaned, or conversely, the value of the increased production after cleaning. These numbers are based on an average electricity rate of $0.15/kWh in Los Angeles in 2013 and would be equally applicable to commercial or residential installations. 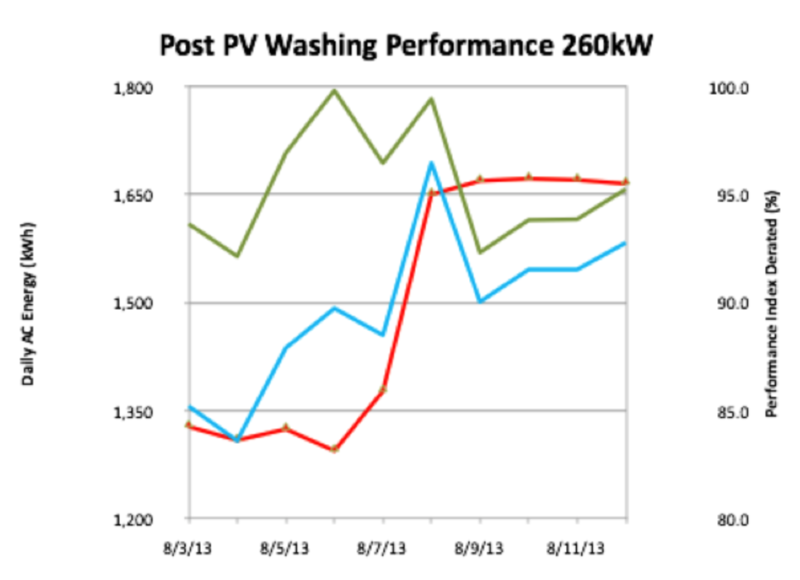 The charts below show the performance improvements in two of the four sites after cleaning the solar panels. The green curve is the estimated expected production, the blue curve is the actual production. The red curve represents the improvement in performance. The time when each system was cleaned and its performance reached a new production ‘plateau’ can easily be identified, as can the reduced difference between the expected and the actual production before and after the cleaning. 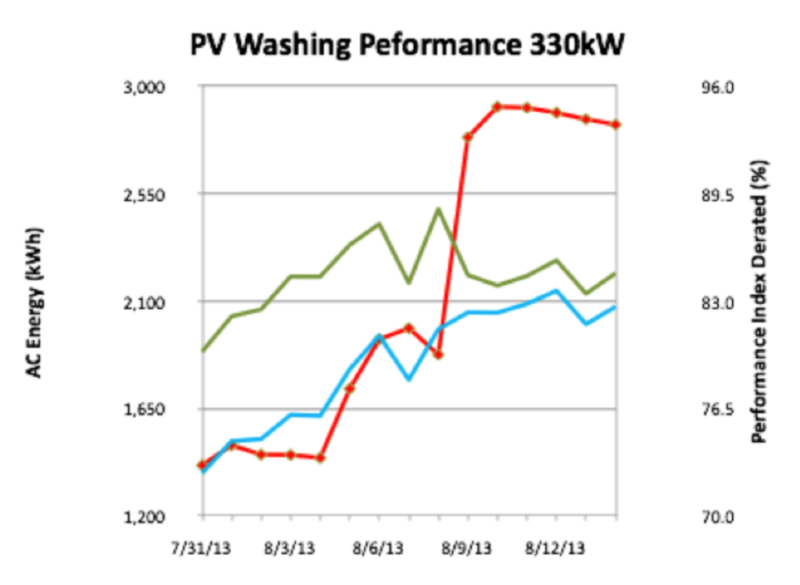 At the larger 330-kW site the performance increase happened over three non-consecutive days of washing (8/5, 8/6 and 8/9/13). As part of our GoClean Maintenance Program GoSolar will clean your solar panels regularly so that your solar energy system can perform at full capacity and provide the maximum savings for you. We also inspect your system for other possible issues, such as damaged panels, and alert you so that any necessary maintenance can be performed immediately and production losses minimized.